After a fun filled and busy year here in the Bulldog community, the Veritas staff looked back at the events that took place throughout 2017. Jan. 5 – Three RHS students receive awards for Voice of Democracy entries. First prize Meaghan McDonough, second Jad Bendarkawi, and third senior Sophie McLellan. 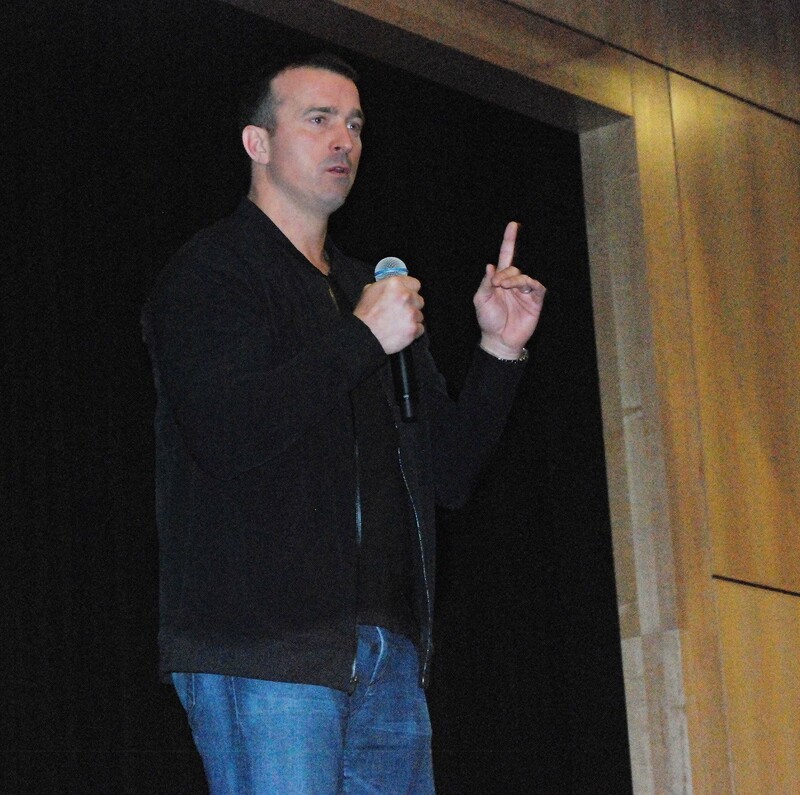 Jan 13 – Chris Herren speaks at RHS. Jan. 20 – Genesis Rojas takes first place in Poetry Out Loud; Adiza Alasa and John Ellard come in second and third. Jan. 26 – Mock Trial team opens season with a win. Jan. 29 – Rockland High School SGC hosts Bocce tournament. Feb. 5 – Sean Vo and Erin Field are accepted for the SEMSBA choir; Lauren Zaremba makes it for the concert band. February Vacation – Harvard Model Congress attends regional conference. March 4 – RHS Theater Guild performs “Room 404” at annual METG Drama Festival. March 8-10 – RHS SGC receives Gold Council of Excellence Award at MASC conference. 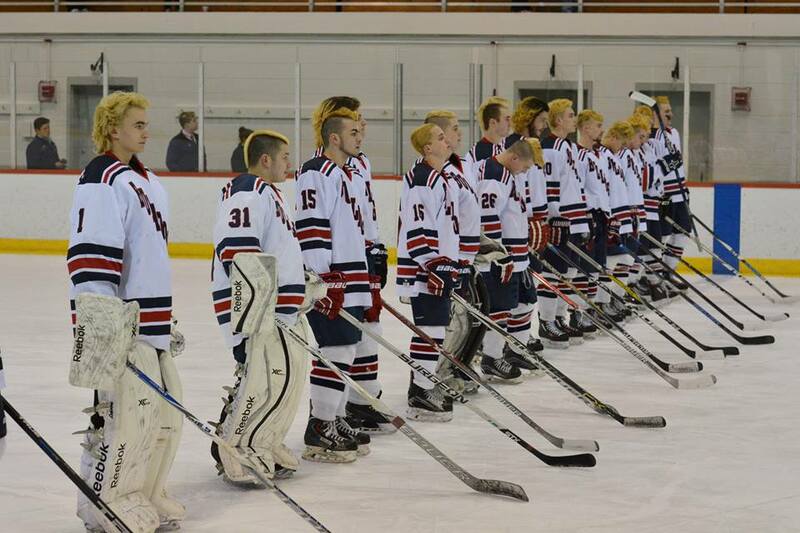 March 12 Rockland hockey team’s tournament run ends in D3 South Finals at Gallo Arena in Bourne; OR takes game 3-1. March 18 – Rockland High School’s cheer team wins Division 4 New England Regional Championships. March 22 – Seven alarm fire engulfs Park St. Factory; all schools’ starting times delayed two hours: Jefferson School closed. March 24 and 25 – Shakespeare Festival- Several groups of students come together, under English teacher, Kristen Walsh’s direction, and give the audience two nights filled with performances of Shakespeare’s works. 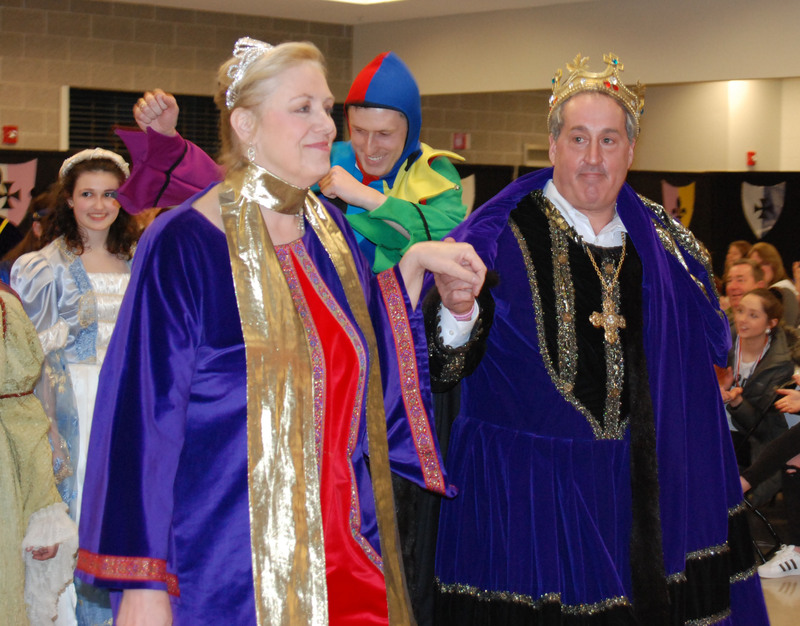 Gary Graziano and Susan Patton are the King and Queen of the Festival. March 31–April 2 – 20 World Languages students visit Quebec. April 5 – Evan Murphy comes in first at the annual Spellman Oratorical contest sponsored by the English Dept. and held in the lecture hall. April 11 – Cheerleaders are honored at Fenway Park. 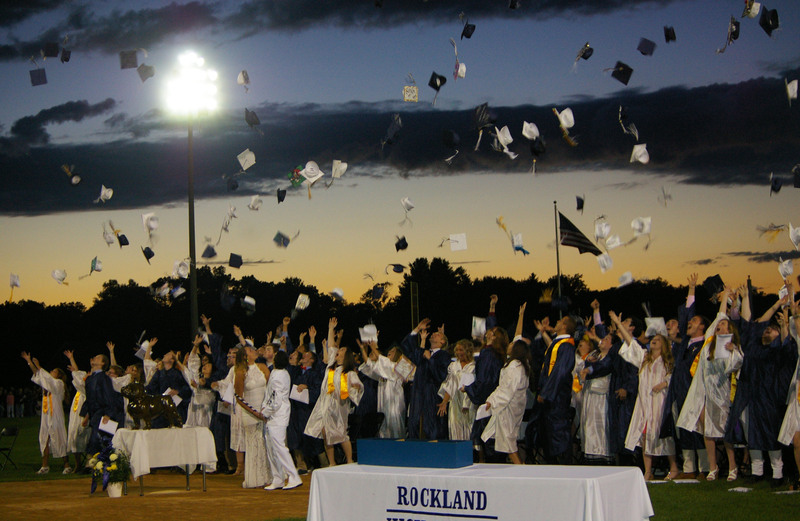 April 12 – Rockland Public Schools holds annual Arts Festival. April 26 – Dr. Cron proposes new elementary school for Rockland. 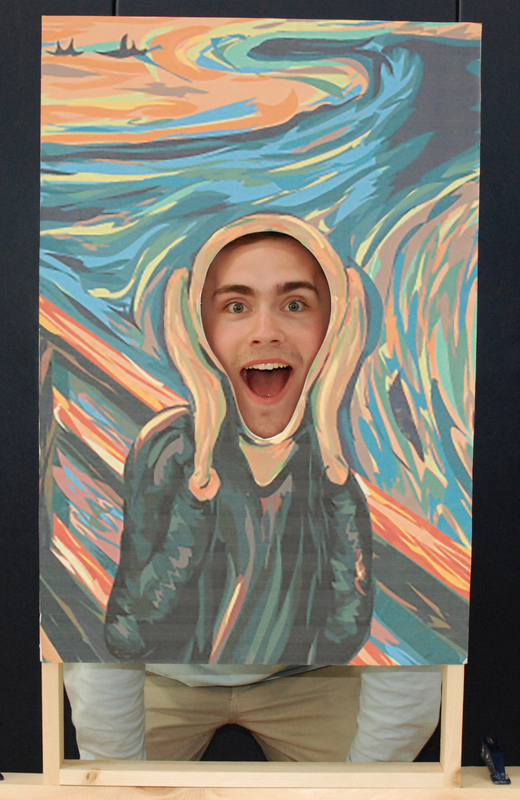 April Vacation – 46 students in the Travel Club visit England, Ireland and Scotland. April 15-22 – 15 students go on service trip to Guatemala. May 3 – SGC holds annual awards banquet. May 4 – Senior chorus and band students honored at annual Pops Concert. May 5 – The Veritas print and web editions win Highest Achievement Awards from the New England Scholastic Press Association; Maddie Gear and Joe Taft win Special Achievement Awards. May 10 – Julia DiCienzo and Matt Dunn are recognized as the top senior male and female scholar-athletes of the year. Two cars were provided for the mock accident on Monday, May 15. 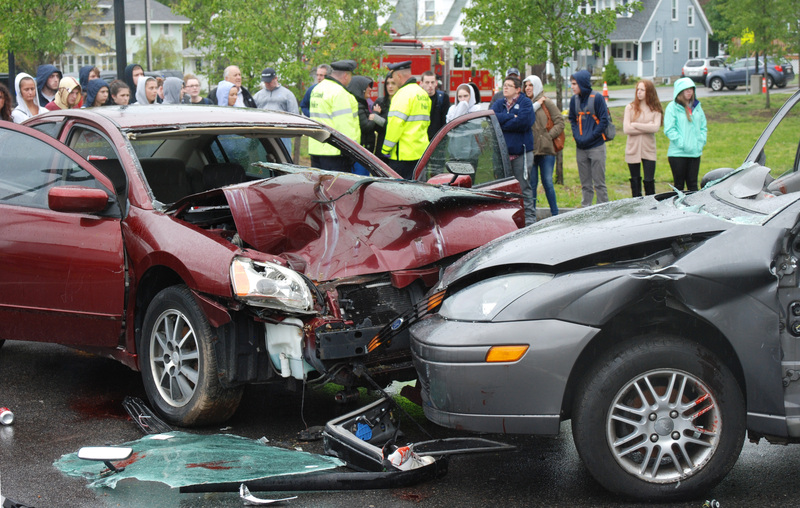 May 15 – Mock drunk driving crash is presented to juniors and seniors at RHS. May 17 – National Honor Society induction held – 20 juniors and one senior join the 2017 seniors of NHS; Teachers, Melissa Shaughnessy and Patrick Finn are honorary inductees. May 19 – Junior-Senior Prom held at Canoe Club in West Bridgewater. May 25 – Boys’ and girls’ lacrosse teams make tournament for first time ever. June 1 – Senior Academic and Athletic Awards Banquet held in auditorium: Luana Lima recognized as Valedictorian of Class of 2017. June 2 – Graduation Day for Class of 2017!! June 10 – God’s Children wins third annual Jared Lewis Quirk Memorial Speedball Tournament. July 8 – Long-time Bulldog, staff member and supporter, Ann Phelps passes away. August 23 – Fall sports practices begin (Football began August 18). August 28 – First Day of School! Sept. 8 – Football team opens season with win over Cohasset. 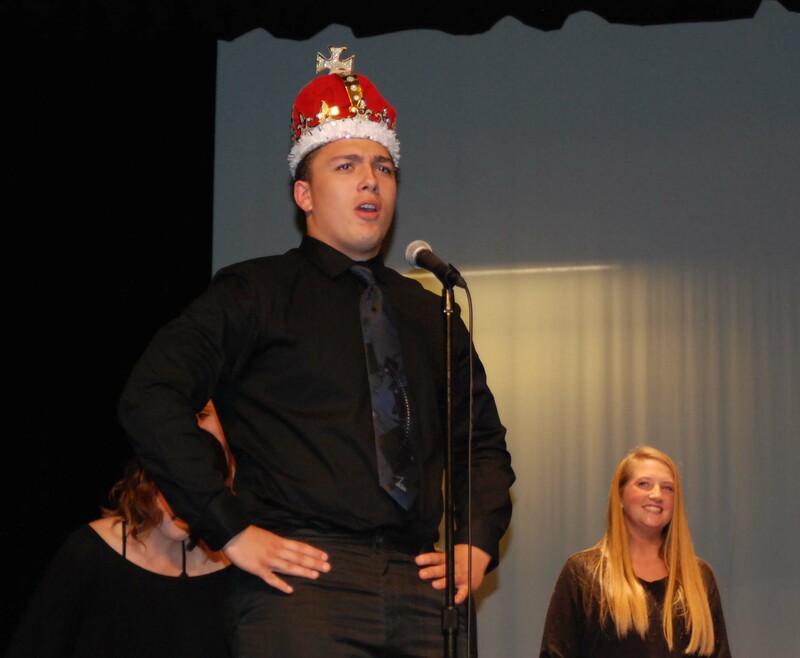 Oct. 18 – Louis Casey is crowned Mr. Rockland. 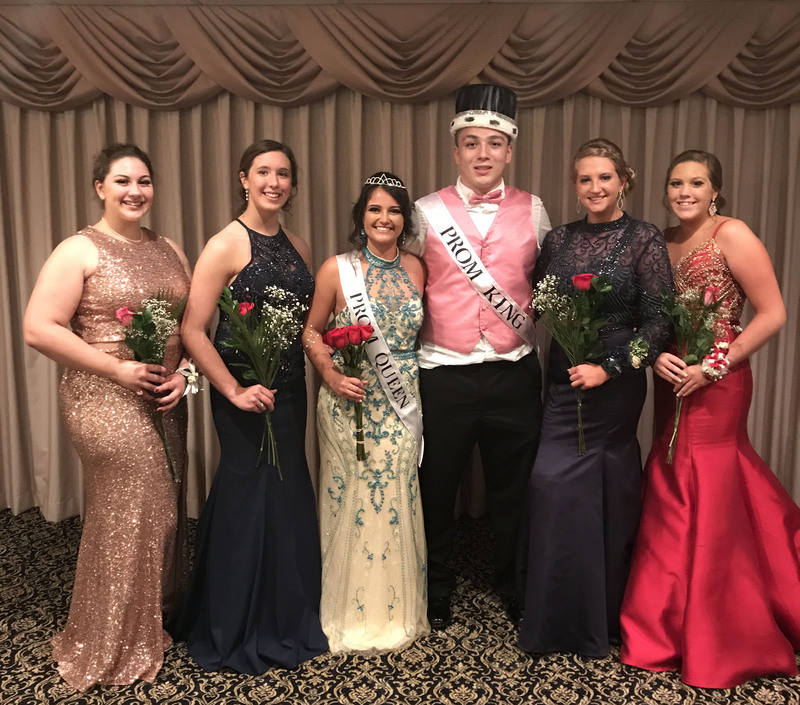 Oct. 20 – Macie Jones is crowned Miss Rockland. 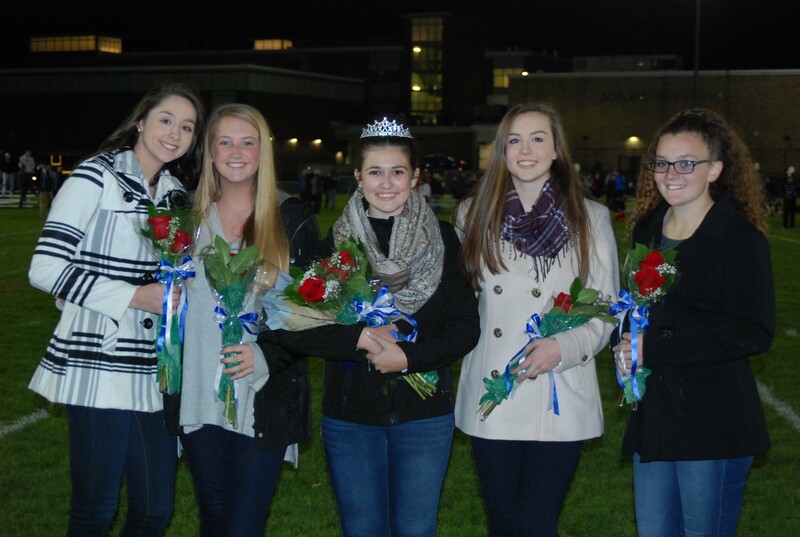 Oct. 20 – Football team wins Homecoming Game, 20-8, over Middleboro. Oct. 21 – Homecoming Dance held in the gym. Oct. 30 – SGC sponsors annual Project Pumpkin. Volleyball, football and cheerleading teams win SSL League Championships; They along with golf and boys and girls soccer teams make postseason tournaments. Nov. 17 RHS receives a Massachusetts District C Athletic Sportsmanship Award from the MIAA. Seniors celebrate their 26-0 win. 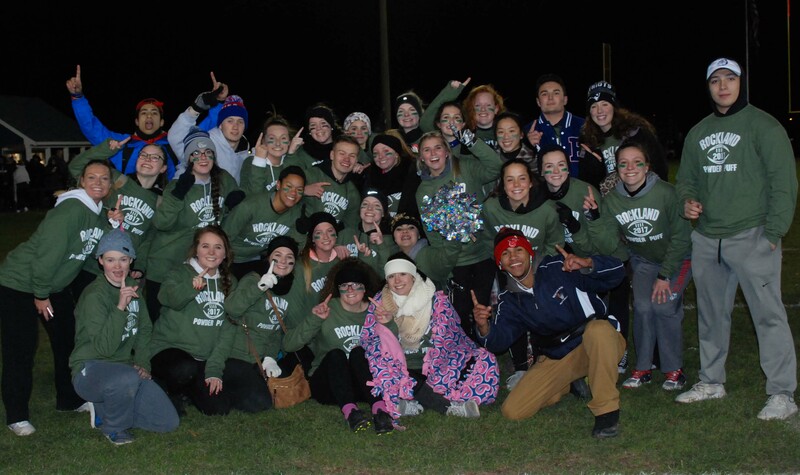 Nov. 17 – Seniors defeat juniors in Powderpuff game 26-0. Nov. 27 – Winter sports teams begin work-outs. Dec. 7, 8 and 9 – Theater Guild’s Moon Over Buffalo performed at RHS. Dec. 11– Positivity Club’s second initiative announced. Dec. 14 – RHS Band and Chorus perform annual Holiday Concert. Dec. 22 – Alumni visit RHS. Dec. 23-Jan. 1 – Happy New Year! Taylor Pendleton, Meg Saucier, Isabella Sacco, Lexi Murphy, Maddie Cedrone, and Taylor Gallagher also took part in the alumni day at RHS. Jordan Cunningham playing the tuba at Esten School. The band on the bus on Friday, Dec. 22. Mr. Piazza explains tempo change during the bands concert at Memorial Park Elementary School in Rockland. The band winds up their field trip at the Robert J. Nyman Senior Center in Rockland. Of course all students and staff were anxious to flee the building and start their holiday break, but RHS students were still awfully busy in the final hours of their last school day of 2017. In the Music Department, the RHS Band traveled to each of the three Rockland elementary schools and the senior center to play some Christmas music for the students and seniors. Later, juniors were called down to the auditorium for a brief meeting to review their final shot at PSATs before the students hopefully take them in the spring. At the meeting students learned how to analyze and break down their scores and also were given tools on how to improve scores and study for the SATs. The senior class had a meeting in the lecture hall where RHS alumni returned to give them a little more knowledge about some schools they might be considering. At the Alumni Panel assembly students were able to ask questions of their graduated friends regarding post high school life. After all of that was said and done, both students and staff anxiously waited to hear the final school bell of 2017 marking the beginning of their holiday break. The four SGC Committee Chairs: Tyler Beatrice, Finance and Fundraising Chair. Sarah Pollard, the newly appointed Student Services Chair. Justin Sherlock, the Community Service Chair. Jacob Leahy, the Unified Spirit Chair. Hannah Boben, Ms Delaney, and MS White leading an energizer. The community service committee posing with their wrapped Chair in the People Wrapping competition. Advisor, Ms Delaney posing in festive gear. Big 5: Treasurer, Macie Jones, Publicity Coordinator, Francisco Oliveira, Secretary, Jaymie Atkins, Vice President, Jill Donahue, and President, Hannah Murphy all in holiday gear. During school yesterday, Dec. 20, teachers throughout the building were shown appreciation on the annual Teacher Appreciation Day. Yesterday, teachers were honored with a complimentary lunch donated by Mike’s Pizza in Rockland. 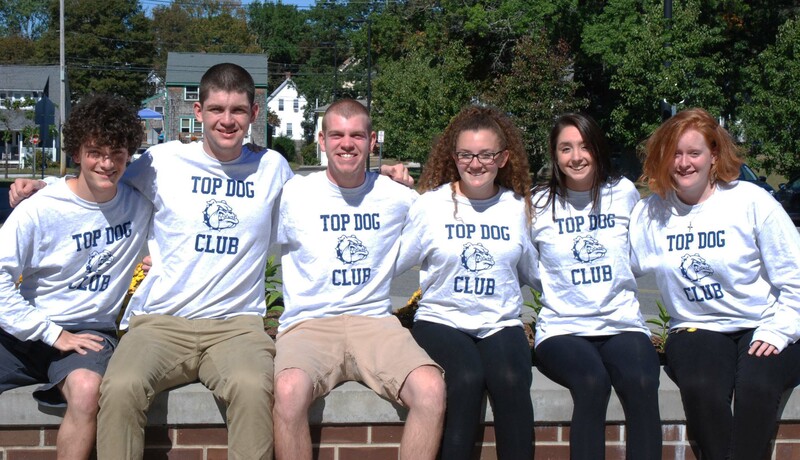 The event was set up by Student Government Council members including the Finance and Fundraising chair, junior, Tyler Beatrice, and junior class Head Representative, Caitlin Cameron. Help was also provided by the Executive Board in setting up and donations of food, drinks, and utensils from other members. After the school day was over, SGC held its monthly meeting. Yesterday’s meeting was extra special because it was the annual, December Ugly Sweater meeting. SGC members were surprised last night by the Big Five with a party in the Middle School cafeteria. At the party, everyone played holiday themed games and activities and was able to snack on the leftovers from the Teacher’s Lunch earlier in the day. All in all, SGC had an action-packed day in and out of school and was able to provide teachers, and members with a fun filled day. 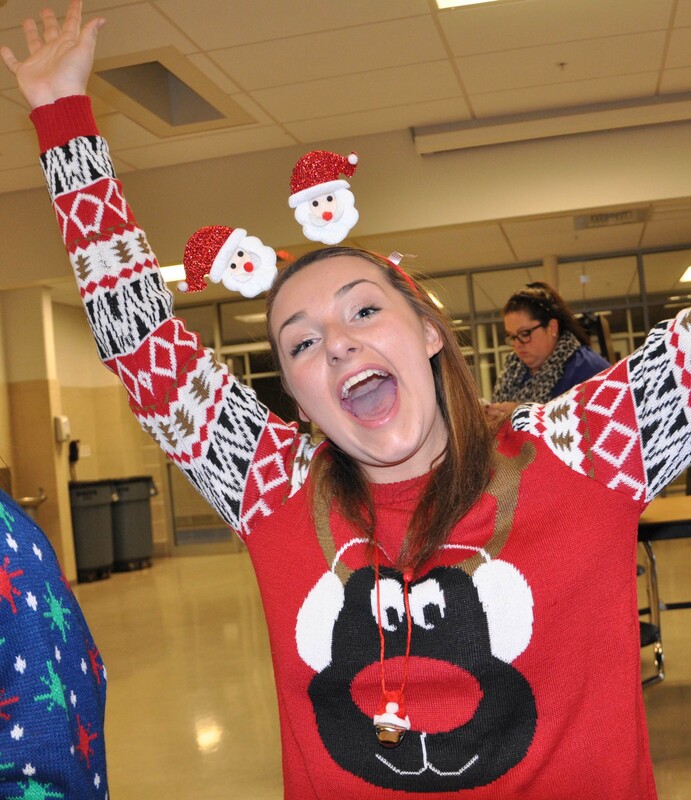 Hannah Boben is ready for Ugly Sweater Day next week. As the Christmas break is rapidly approaching, RHS is celebrating the holidays all next week from Dec. 18-22 with a Spirit Week! Be sure to get your outfits ready over the weekend to go all out next week! This past weekend, from Dec. 7-9, the RHS Theatre Guild performed their annual fall play, the Broadway comedy, Moon Over Buffalo. The play starred senior, Ronan McNally (George Hay) and junior, Megan Diver (Charlotte Hay). Other cast members included, freshman, Emily Gaboriault (Rosalind Hay), junior, John Ellard (Paul Singer), and seniors, Kellie Berry(Ethel), Ryan Struzziery (Howard), Erin Field (Eileen) and Ryan Mott (Richard Maynard). The comedy was directed by Pathways teacher, Joanne White and biology teacher, Julia DiCanzio. Senior, Madison Parlee worked on the play as Stage Manager and working by the side of Parlee was junior, Ali Landi who helped as Assistant Stage Manager. After all the crew members’ hard work and effort, they were able to reap the benefits after finally performing their work this past weekend. Along with the crew, the audience enjoyed themselves as well. Laughter filled the auditorium and smiles filed out of the building each night the play came to a close. RHS Theatre Guild’s winter play of the year, Moon Over Buffalo, is premiering this Thursday, Dec. 7 in the RMS/RHS auditorium. The comedy is being put on this Thursday, Friday, and Saturday at 7pm each night. Tickets are on sale now at showtix4u.com for $5 each or can be bought at the door for $8. The comedy features senior, Ronan McNally and junior, Megan Diver as the main characters of George and Charlotte Hay. The Theatre Guild has been hard at work perfecting the play with help from their directors, Joanne White and Julia DiCanzio. At the play, be sure to stop by the Engineering Club table! Before and after the play they will be selling 3-D holiday ornaments. 3-D ornaments are being sold for $5. Bulldog plaques are also being sold for $7. They can also be customized for a total of $10. Above on the left shows an example of the $10 customized plaques. Above to the right shows the $7 plaques. On the bottom displays the $5 bulldog ornaments.